The following originally appeared on 9/2/08 at Exit 51. Unofficially, summer is over. Labor Day has come and gone and kids are back in school. Soon enough, the leaves will start changing color and carpet our lawn as they fall from the trees. We will shut off our A/C, open the windows wide, and enjoy crisp cool evenings. Until then though, that A/C is running. Our little house gets HOT like you wouldn’t believe. So to help things along, and try to keep the electric bill down in spite of my addiction to central air, we have all kinds of fans around the house. Ceiling fans, floor fans, big fans, little fans. The one exception was the guest bedroom. Until recently, the room didn’t even have a bed, let alone a fan. But we’ve got company coming in a few weeks so it was time. The plan was that SFC would install not one, but two ceiling fans. One in the guest room and a new one in our room. While he was doing that, I would be cooking. You know how it goes with the best laid plans? They never quite turn out the way you think they should. Instead of peeling and chopping and sauteing the afternoon away, I was twisting and torquing and cordless drilling. Four hours later the fans were installed but the day’s cooking was a bust. 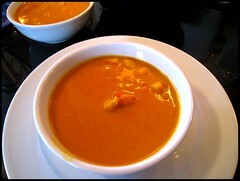 All afternoon I had been thinking of Sweet Carrot Soup. In a perfect world, I could have had both new fans and soup. In the real world, the soup would have to wait a day. Let me tell you, it was worth the wait. So when those cooler fall days do arrive, you will most certainly find a pot of this fantastic creamy goodness warming on our stove. In a 4 quart pot, heat olive oil over medium heat. Add onions and garlic and cook till softened. Add carrots, red pepper flakes and cook, stirring occasionally for 10 minutes. Add 2 cups chicken broth, one cup water, and diced sweet potato. Bring to a simmer and cook 15 to 30 minutes or until carrots and sweet potato are tender. Puree with a stick blender in the pot or in batches in a food processor or blender. Return puree to the pan and add remaining chicken broth one half cup at a time until your desired consistency is reached. Season to taste with salt, pepper, and cumin. I added some sweet curry and lobster meat to the soup but the possibilities are endless. Glad you got the fans installed but sorry to hear about the problems you had doing it. The soup looks delicious though, and I agree, worth the wait! Jennifer, this soup definitely made up for the delays encountered getting it to the table. I made my first carrot soup a couple of months ago. I had carrots…they needed to be used and it seemed to be a good way to get rid of them. You know how that goes. What I did not expect was how much I loved that soup, enough that I’m imagining how good this is…on a hot or cold day! Barbara, welcome to the world of carrot soup. It’s been a while since I’ve made this so maybe I need to get it back on my menu.